What Can Aquariums Do To Reduce Plastic Pollution? Aquariums are in a great position to educate their visitors about the harmful impacts of plastic pollution. Lots of people visit aquariums—more than 183 million, worldwide, each year—and, according to research, they trust them more than most other public and private agencies. I was thrilled to be invited to speak at a gathering of Aquarium staff from all over the country in Monterey Bay last month. About 100 guests representing 20 aquariums, nine environmental non-profits, a handful of consultancies, and a food and retail service provider participated in the event. We know that 80% of marine pollution is land-based. In other words, the ocean and wildlife are chocking on toxic plastic pollution that originates on dry land. The bulk of land-based litter—67% according to a Clean Water Action study-- is made up of single-use disposable (SUDs) food and beverage packaging items. This is where our ReThink Disposable program comes in. Our most significant opportunity to prevent ocean litter is through the elimination and reduction of SUDs. Change begins at home and in our local communities. Aquariums have a unique opportunity to teach visitors about the environmental impacts of our addiction to SUDs commonly found in food service and stress the importance of practicing source reduction in their everyday lives. Aquariums can demonstrate best practices and eliminate and reduce the the use of SUDs from aquarium food service operations. Already, aquariums are taking giant steps toward making that change by hiring companies like Service Systems Associates (SSA) to reduce the use of disposables and still maintain a revenue stream through the food service operations. SSA eliminated bags at the Houston Zoo, stopped selling bottled water at the Detroit Zoo, and eliminated SUDs from the on-site café at the Monterey Bay Aquarium, while maintaining profitability. Aquariums rely on revenue from food and beverage sales and therefore, sustaining a profitable food service operation is an important factor to consider when making a decision to eliminate a valuable commodity like the sale of beverages in plastic bottles. At the Symposium, I presented on a panel called “Walking the Talk” with Molly Martin – Coastal Watershed Coordinator with EPA Region 9, John Houck – Deputy Director at Point Defiance Zoo & Aquarium, and moderated by Leslie Peart – Vice President of Education and Conservation, from Texas State Aquarium. 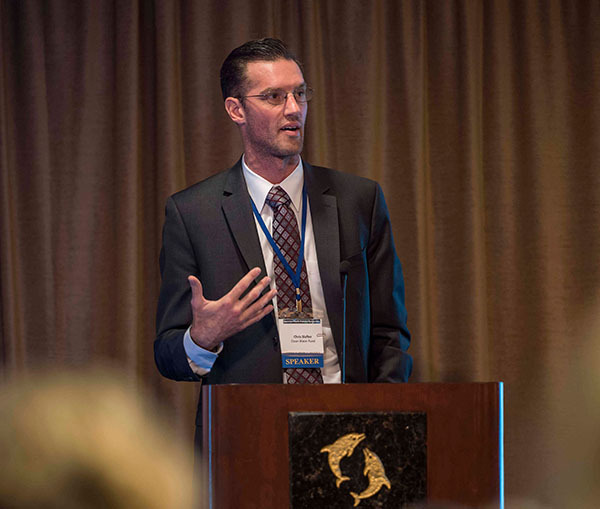 The focus of the panel was to discuss what best management practices could be adopted by aquariums to eliminate or reduce the use of single-use disposable foodware items from on-site food service operations. Our nation’s aquariums are in a position of great influence over the public’s perception of plastic pollution. Found within aquarium walls and contained within exhibits is the tremendous potential to align an individual’s behavior with a solution that will reduce or eliminate plastic pollution. At the Symposium, I saw aquarium directors, managers, and staff members learn from experts about the impacts of plastic pollution and what solutions are out there. —Clean Water Action’s fellow NGO’s in attendance were: Adventure Scientists, The Last Plastic Straw, The 5 Gyres Institute, The Lonely Whale Foundation, Ocean Conservancy, Save Our Shores, Upstream, and the Ocean Recovery Alliance.